At Starr Septic Services, we are your source for Camden County portable toilet rental. Starr Septic is based nearby in Franklinville, NJ, and we offer septic and toilet rental services to residents and businesses throughout South Jersey and Camden County. In addition to providing clean and comfortable portable facilities, we handle septic inspection and repair, septic pumping and a host of other services. Starr Septic is a proud member of Starr General Contracting, which has been serving South Jersey for over 30 years. Whenever you need a port-a-pot, port-a-john or whatever you call them, of course you want a unit that is brand new and well cleaned for events or for workers. When you call on Starr for one or more portable toilets, we’ll take care of both delivery and service of the units, including keeping the paper and necessary sanitary items restocked as needed. 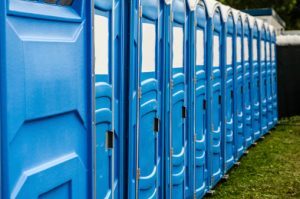 For your Camden County portable toilet rental needs, we provide rentals on a 3-day, 7-day or monthly basis, with units that are accessible for handicapped users and equipped with a hand sanitizer or foot pump. Should you require a rental for a longer length of time, we’ll handle the pumping to keep the unit sanitary and clean for comfortable and continued use. We also rent out restroom trailer units for larger events! Our restroom trailers feature many more creature comforts, from running water and actual toilets and sinks to private restrooms for both men and women. Our portable trailers are great for larger-sized parties, events, corporate fundraisers, or any outdoor portable facility need. Be sure to have clean, comfortable portable toilets for your next event and take one worry away from your plans. Call Starr Septic today at (856) 875-5020 for a no-cost, no obligation portable toilet rental estimate. Starr has the toilets to meet your event or job site needs.